As there will be a high number of people coming on foot, there will be road closures and parking restrictions from approximately 5pm around the arena. Regretfully, the tow truck guys can be very enthusiastic, so please check signage carefully to avoid having your night spoiled. The outdoor plaza is a public area with no shelter, it's not ideal for camping overnight. If you plan to line up early, make sure you arrive during the day on Wednesday, no earlier than 6am for your own safety. Bring weather appropriate clothing, sunblock, food and drinks for the wait. You should be ok to bring in a sign, but keep in mind they; cannot have any sticks at the sides, must be made from paper, cardboard, fabric or other soft material, and need to be of a reasonable size (keep in mind how much it would block the view from others sitting or standing behind you). If you are on the standing floor, you are going to want to head to Entry C & G when you arrive - check what it says on the top part of your ticket. 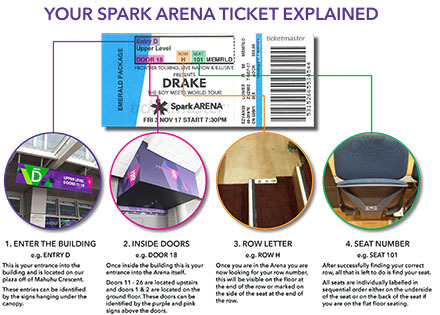 For access to tiered seating, head to Entry D & E and then straight up the stairs once you are inside the arena to get to your seats. Entry B is our mobility access entrance which you are welcome to use if needed, regardless of which door is printed on your ticket. The merchandise caravan will be open from approximately 4pm selling official Billie Eilish items. The caravan is located outside the arena on the main plaza.